Mokomba - Through the richness of West African arts and culture, BaoBao Foundation strives to create an inclusive community here in the USA, while providing opportunities for communities in Ghana, West Africa. Adjei Abankwah was a principal dancer and choreographer with The National Ghana Dance Ensemble for 11 years. In addition to dancing, he is an accomplished musician and composer. Adjei plays a number of traditional African instruments including flute, xylophone, bass marimba, and drums. Adjei is a skilled choreographer and has choreographed pieces for Blue Moon Dance Ensemble and many others. Colorado residents will have the opportunity to view his unique choreographed pieces when he performs with the talented drummers and dancers in Mokomba Ensemble. Nii Okai Aryeetey, our master drummer performed with Hewale Sounds and taught drumming at the University of Ghana at Legon. He is now the lead drummer with Mokomba Ensemble. He is known as the legendary "Spider Hands". Nii teaches drum classes in Boulder and Lafayette for kids and adults. Dai Kato, co-established Mokomba Ensemble in 2010 with Adjei and other three dancers in Boulder. He is originally from Japan and believes he was "African' a few lives ago! He started African drumming as part of his mentoring program for inner city African-American kids at Chester, PA where nation's highest crime rate city. His passion for performance is it's effect of healing the people and bring our world to little better place. He is also founding board member of Bao Bao Foundation and enjoy performing to complete our Bao Bao Library in Ghana! Kasey Schelling, Born and raised near Chicago, Illinois is a lifetime lover of music and dance. Mokomba has been one of her life's greatest gifts, for the friendships that have been made are such a strong source of joy. She believes that the celebration of West African culture has an immense power of bringing people together. Isabella Dzidefo Asamoah, A native of Ghana and a member of the Ewe tribe, Isabella grew up immersed in the culture of oral tradition, song and dance. After moving to Colorado, it was not until her time at the University of Colorado that she reconnected with those parts of her identity. She joined Mokomba Ensemble upon graduating from college as a way to stay committed to her homeland and to give voice to the stories of Africa and the Diaspora. Greg Adelman, Bio coming soon. Cara Hurley, Bio coming soon. NaNa Boakye, Bio coming soon. We perform throughout the year all over Colorado. We visit most of major Universities in Colorado as well as K-12 schools to offer cultural experiences, performances, and workshops. You may book Mokomba Ensemble for non-profit fundraising events, corporate parties, cultural events and entertainment at your venue. We are available for up to 2 hours of authentic African dance and drumming performance sets including singing and collaboration with other musicians. Please contact us if you are interested in booking Mokomba Ensemble! 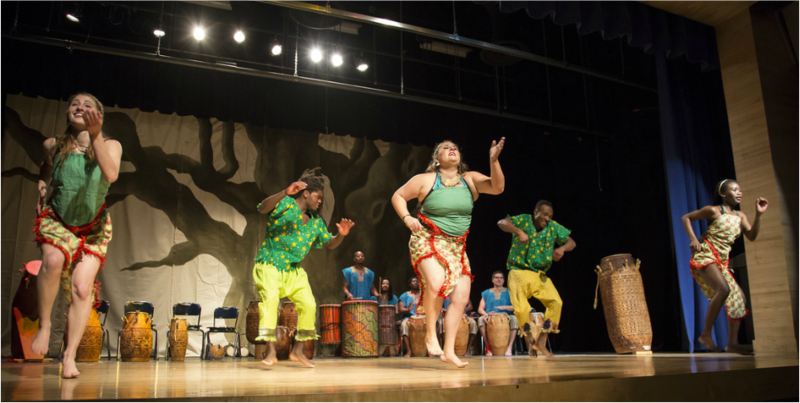 "Mokomba Ensemble, a local African drum and dance troupe, is known to warm the atmosphere of any venue, led by Ghanaian choreographic director, Adjei Abankwah and master drummer, Nii Okai Aryeetey. Mokomba members come from all ethnic corners of the world giving the richness of both traditional and contemporary works of African drum and dance drawn from all reaches of continental Africa. Mokomba's vibrant and engaging performances stem from the extensive experience of the group leaders; Adjei, with the Ghana National Dance Ensemble and Nii Okai's involvement with widely known group, Hewale Sounds."